Another successful paella cooking event. A recreational and cultural activity that improves teamwork and results in a unique experience that will not be forgotten. We moved with the group from the hotel to the Albufera. Our guide was making a panoramic view on the way so that the clients could get to know our rich natural heritage. They loved the landscape from their seats. The large extensions of rice fields and the traditional Valencian barracks. 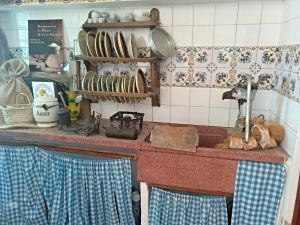 When we arrived at El Palmar, an old fishing village, we went to visit a traditional Valencian barraca where they could learn about the way of life of the farmers and fishermen who lived from their agricultural work as well as the tools they used for their work. It was very interesting to get to know its interior structure, very simple, and with an upper floor where the silkworm used to be bred. 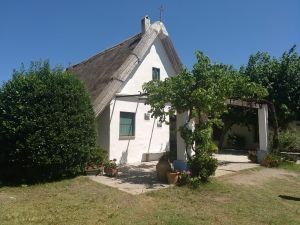 At the end of the visit to the hut we embark from its own pier in two boats to take a pleasant boat trip through some of the hundreds of canals of the Natural Park and Lake Albufera. They were also able to get to know the important protected natural environment, habitat of numerous autochthonous species and place of bird migration. It was very interesting to discover the natural wealth that surrounds us in a place so close to the city of Valencia. From the boat it was interesting to see the fishing techniques that are used to get especially the liza or llisa in Valencian, and, to a lesser extent, the eel. 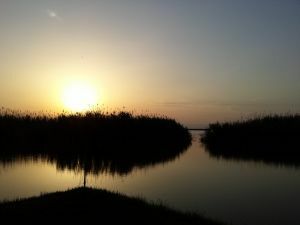 Spectacular was to enjoy this sunset in the Albufera, one of the most beautiful you can contemplate. The sunset between canyons and canals, with the faint rays of the sun reflecting off the water. Surrounded by silence, calm and nature. 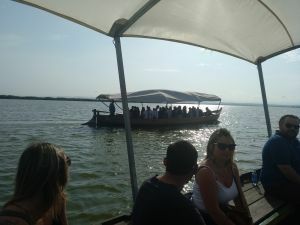 A complete guided tour around the Albufera Natural Park and Lake to discover some of the most deeply rooted Valencian traditions. Beginning of “paella cooking” everyone to cook! 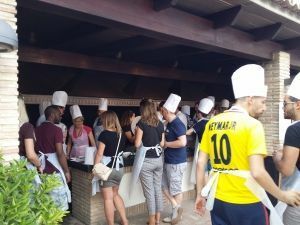 We disembarked directly at the pier of the restaurant where we were going to have fun and learn to cook an authentic Valencian paella with our “paella cooking”. Cooking starts at 3, 2, 1… Now! 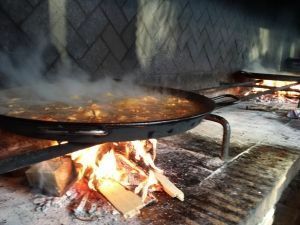 A paella cooked over a fire, as was traditionally done and that gives a characteristic flavor and much more intense rice. 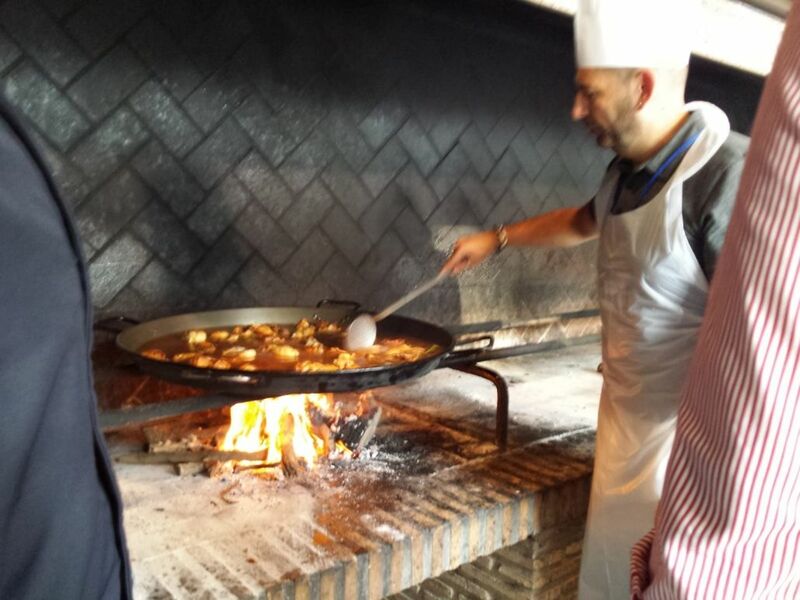 We adapted to the needs of the group and made two chicken paellas and one vegetable paella for our halal customers. 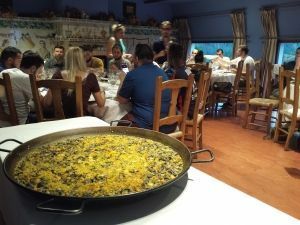 It was a very intense experience since, divided into three groups and supervised by two chefs, they launched themselves and got involved to the maximum to cook the best paella. Dressed in a hat and apron, which authentic professionals of the kitchen, learned to cook our most representative and international dish. Meanwhile, they enjoyed a delicious aperitif and fresh drinks that served them continuously until they finished cooking. Laughter, photos, competitiveness and a lot of teamwork. And, suddenly, our tuna came to surprise and brighten up the end of this gastronomic activity. 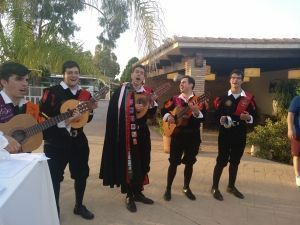 Everyone was delighted taking pictures and dancing to the well-known Spanish songs with which we were delighted. Now it’s time to fill our stomachs and find out who won. 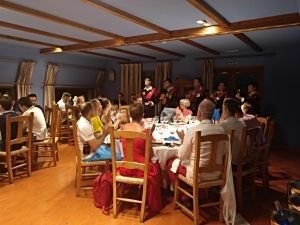 After the “paella cooking” we went to the restaurant’s dining room to rest and taste Valencian dishes such as Valencian tomato salad season with ventresca, among others, and, as could not be otherwise, the paellas previously cooked by themselves. 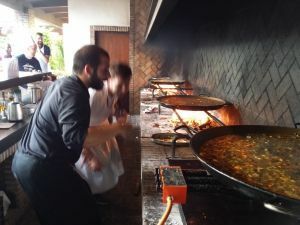 In addition, our expert chefs were able to taste the three cooked paellas and appreciate both their flavour and their presentation. At the same time, another jury was able to evaluate other concepts during the “paella cooking” such as teamwork, attitude and participation. Finally, and what was very amusing, each team had to say the Valencian phrase “la meua paella es la millor”, in order to finish the evaluations. All did it wonderfully but we did not obtain any tie reason why clearly we had a first, second and third winner of this “paella cooking“, of this gastronomic event in the Albufera. Again, and with the desserts our tuna was able to put the end of party to an event in which there was fun and culture at par. Another event in Valencia that ends with success and good taste in the mouth.